The following letter was written to the Abbey residents after Lydie, a young woman from France, visited us for nearly two weeks in August and September, 2006. My stay at Sravasti Abbey was so wonderful that I want to thank you all to have welcomed me there. Describing my experience is not easy to do as English is not my first language, but I will try. I didn’t know what to expect from this trip. I was seeking a refuge, both a temporary and an ultimate one. I had a very rough time before coming and needed to feel secure and quiet. 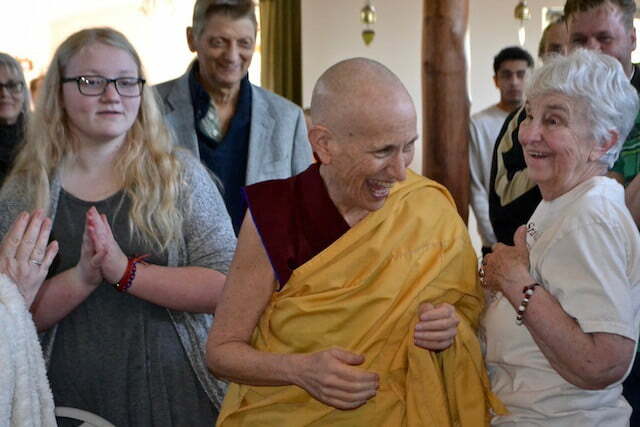 I had asked Venerable Chodron to take refuge with her, as we were corresponding for more than one year. I already felt very close to her, even before meeting her in person for the first time. Did I find what I expected? Yes, and much more than that. Since they picked me up at the Spokane airport, I was surprised by the kindness of all the friends of Sravasti Abbey. This is the first point I noticed: everybody is so kind there. I rejoice at the positive potential they accumulate every day being like that. I was so fortunate to receive such sympathy. That proved to me that I had enough positive potential too, and it erased my habitual thought that I was a bad and worthless person. I also became friends with beings who scared me – such as the wasps that flew around when we ate lunch outdoors – and realized that I was considering them as enemies. So I placed them in front of me while doing the visualizations in morning and evening practices and learned to pray for them too. I must confess that, before this, I thought that I didn’t have any enemies in this world to place before me in visualizations. This thought seems so stupid now! I understand today that I regard every sentient being who frightens me as enemy. There are so many, and they need love and compassion too. It is amazing to see that, with the good motivation to offer service to the community, I did with delight even the things I usually dislike doing – for example, vacuuming, mopping the floor, washing the bathrooms, emptying the compost bucket. I didn’t fall into my habitual attitude, “I don’t want to do that! It’s so boring!” because I knew why I was doing so. And interestingly, the “why” was to benefit other people, not me. I wasn’t doing things for my own benefit and comfort, and that gave me a new type of satisfaction. I had experienced community life before, but I had never found this kind of enjoyment in doing chores. I guess that being housed and fed free of charge definitely helped me to work with joyous effort, because we feel grateful for what is given to us and we don’t have our usual attitude, “It’s normal. I paid to get from this.” This is a very strong lesson for me. I think that I should work everyday with the motivation to sustain myself in order to be able to serve all sentient beings – I often forget the last part of this motivation! These things were not the main purpose of my stay in Sravasti Abbey, but I think they are really important regarding living in community. My veritable intention was to meet Venerable Chodron and thank her personally for the help she gave me through her compassionate and comforting letters and calls. I guess she saved this precious human life from great mistakes I was about to do. She reminded me of Mother Tara’s permanent presence and protection. She showed me that, whatever pain I have endured in the past, there are beings who are still suffering now. I learned to let go of these things from the past and to focus in the present. I discovered that I have skills I can develop to alleviate sentient beings’ afflictions, my own and others’. So I decided to begin to practice all the advise I have received for the past eight years from my teacher here in France. To do so, I wanted to reaffirm my commitment to the Dharma by taking refuge and precepts. The refuge retreat revealed that what I was usually taking refuge in was self-injury. That was probably the worst of the bad things I used to do when events didn’t go the way I wanted them to go. I used to feel alone facing the whole world, and hurting myself was a way to deal with that, because I felt I was unable to change anything. I was looking for someone secure and constantly here for me. Now I take refuge in Mother Tara. But learning this was not enough. I also realized how selfish it was not to be confident in myself and others’ capabilities and wisdom. I saw how my self-centered attitude caused pain to my relatives. and that was contrary to what I wanted for them. So the best thing I could do was to try to get better – until enlightenment – to be able to help them to escape from suffering and attain happiness. This was my motivation to take refuge with Venerable Chodron on the 2nd September. I don’t want to remain craving others’ protection from harms and fearing managing my own life. That’s what I will work on. Keeping precepts will help me to deal with everyday life and guide my relationship with others. Now I know what to do and what to avoid. I recognize it is possible to escape from my usual bad mood and the hell this life was before. There’s a way to do so, and I just need to follow it. I would like to find the key to see things as they really are, not to go on with the fear of suffering that always comes when temporary happiness ends. I would like to believe that the meaning of this life is not in our daily worldly concerns. I would like to have a larger perspective on life than just thinking of having a job that will provide me with enough money to pay this month’s living costs. That’s why I took refuge and precepts. I came back home bringing with me the happiness I had with you and sharing it with my relatives. They found me a lot better and they feel at ease. My practice is deeper now, and I really feel the urge to practice and a joy in meditating. I would like to come back to the Abbey next year to attend retreats and receive teachings. Dear compassionate Mother Tara, please help me to fulfill these wishes so that I can improve my practice and be more and more beneficial for sentient beings! Thank you for everything. May you all be well and happy.